Are authenticity holograms secure enough? Here is a "Derek Jeter" signed hat on eBay with a Steiner hologram and generic Steiner card, which states "Derek Jeter Autograph." At best, this signature is highly suspect. Additionally, it appears to be a cheap knock off hat -- note the oversized NY logo and it is probably an adjustable cap as well. 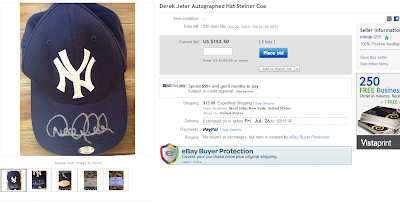 Is it likely that Steiner is selling Derek Jeter signed items on unofficial merchandise? So, this leads me to believe it is either a real Steiner hologram removed from another item or a counterfeit Steiner hologram. Either way, it does not bode well. As reported on Net54, it seems that bad items are appearing with otherwise credible holograms with more and more frequency. If they are counterfeits, Steiner, MLB and the third party authenticators need to go after the sellers and find out where they are coming from. If they are legit holograms removed from other items, these holograms are not secure enough and need to be redesigned so they tear apart if removed. I know from personal experience I had a Steiner hologram fall off of a game used ball with only a tiny fleck of the backing being damaged. A lot of collectors only trust items from supervised signing such as Steiner, MLB, TriStar, etc. If the credibility of these holograms comes into question, these collectors will leave the hobby and that is bad for all of us.